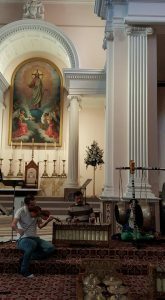 On 7 May 2017 Gamelan Padhang Moncar performed Jack Body‘s first composition for gamelan, ‘So Short the Life’ as part of a choral concert with Nota Bene chamber choir at Wellington’s Sacred Heart Cathedral on. Jack Body (1944-2015) was a key figure in the introduction of gamelan music to New Zealand. 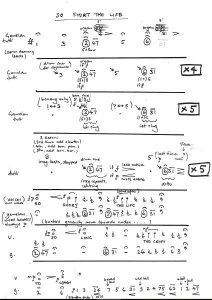 Recreating the piece was a challenge as Jack’s handwritten score was a little cryptic to understand (see sample below). Using an audio recording of the original performance provided by Nga Taonga Sound and Vision and under the direction of Gareth Farr, who had been one of the original performers, we were able to successfully recreate the piece, albeit in somewhat shorter form. 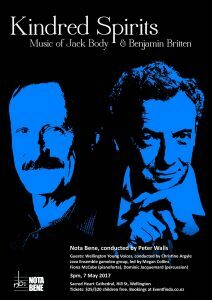 The piece was very warmly received in the context of a concert of several of Jack’s choral works, juxtaposed against simlar works by Benjamin Britten. The Wellington Young Voices children’s choir came and sat near the gamelan to see and hear the piece which benefited from the superb acoustic of the cathedral. The concert was opened by our director Budi S Putra who sang a macapat verse, accompanied by himself (gender), Tristan Carter (violin), and Pippa Strom (gong). Chamber choir Nota Bene, conducted by Peter Walls with guest artists Wellington Young Voices, conducted by Christine Argyle, Gamelan Padhang Moncar, led by Megan Collins, Fiona McCabe (piano), Dominic Jacquemard (percussion). Britten’s ‘Hymn to St Cecilia’ is one of his most loved choral works – and one that is important in his development as a composer. Jack Body’s ‘Wedding Song of St Cecilia’ is, similarly, one of his most loved and significant choral works. Both composers set sonnets by Michelangelo (in one case, the same sonnet). Both composers were inspired by the music of Asia – and, in particular, by the Javanese gamelan. Both transformed medieval hymns (Britten’s touching ‘Hymn to the Virgin’, Body’s remarkable ‘Carol to St Stephen’). Both wrote settings of Psalm 150 that share a strong rhythmic interest (Britten’s for children, Body’s for adults). This is neither imitation nor chance. Their individual voyages of self-discovery took them down similar paths. Coincidences abound (even photos of both composers on the tennis court). Nota Bene (in partnership with Wellington Young Voices) is delighted to present this rich programme on the occasion of Waiteata Music Editions’ release of a group of Jack Body choral scores. Nota Bene is Wellington’s most versatile chamber choir and has forged a reputation for its innovative programming and high performance standards. Under the musical directorship of Peter Walls, the ensemble performs a wide range of choral music, from classical through to contemporary art music and jazz. This entry was posted in 2017, Music, New Zealand and tagged Benjamin Britten, choral, classical, Gamelan Padhang Moncar, Jack Body, modern composers, Nota Bene, Wellington.